PRESS RELEASE Permanent Mission of Sri Lanka to the UN Geneva. Minister Perera provided Secretary Dimapilis-Baldoz with an update on the Colombo Process, including an elaboration of the strategic vision and roadmap for Sri Lanka’s tenure as chair which he noted is being currently presented to the Geneva-based Colombo Process membership by Sri Lanka’s Ambassador \ Permanent Representative to the UN in Geneva. He reiterated that Sri Lanka attaches high priority to migration, and therefore the Colombo Process. Recalling that it is the Colombo Process that paved the way to the formation of the Abu Dhabi Dialogue, a Regional Consultative Process formed to promote dialogue and partnership among countries of origin and destination in Asia in January 2008, Minister Perera congratulated the Philippines for its steering of the Abu Dhabi Dialogue at a crucial time in its evolution. He indicated that Sri Lanka’s strategic vision of the Colombo Process perceives it as a platform for dialogue among countries of origin as well as engagement with countries of destination. Minister Dimapilis-Baldoz provided an update on recent activities in the Abu Dhabi Dialogue under the chairmanship of the Phlilippines, including reference to the salient points of the Manila Communique of April 2012, as well as the upcoming Troika Meeting. On the bilateral front, the possibility of negotiating an MOU between Sri Lanka and the Philippines on labour cooperation was discussed. Minister Perera complimented the Philippines for its excellence and expertise in training human resources and looked forward to learning from and sharing good practices in the field. Minister Perera wished the Philippines a speedy recovery from the devastation caused by typhoon Haiyan \ Yolanda, and as a gesture of solidarity and friendship with the people of the Philippines, arranged for the donation of 1000 kg of tea for distribution among the families affected by the typhoon. A symbolic presentation was made to Secretary Dimapilis-Baldoz to mark this donation. Minister Perera in conclusion extended an invitation to Minister Dimapilis-Baldoz to visit Sri Lanka. During the visit, Minister Perera also visited the Philippines Technical Education Skills Development Authority (TESDA) and the Colombo Plan Staff College in Manila. 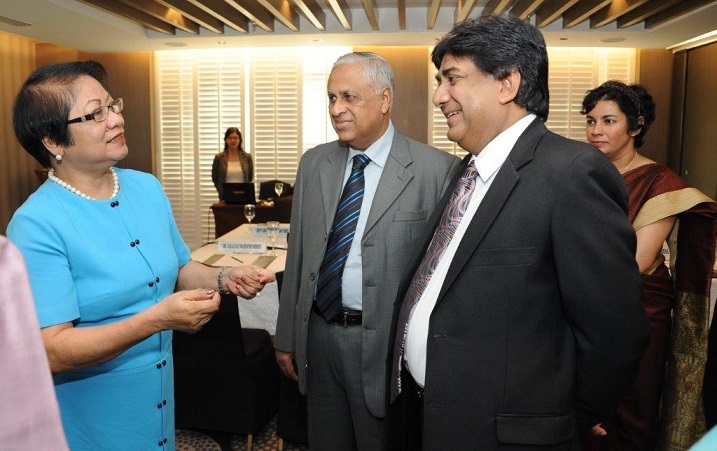 The Minister was accompanied on the visit by Secretary, Foreign Employment Promotion and Welfare Mr.Nissanka Wijeratne, Sri Lanka’s Charge d’Affaires in the Philippines Ms. H.M.G.R.R.K. Wijeratne Mendis and Sri Lanka’s Deputy Permanent Representative to the UN in Geneva Ms.Manisha Gunasekera. This entry was posted on Wednesday, January 8th, 2014. You can follow any responses to this entry through the RSS 2.0 feed. You can skip to the end and leave a response.